Braxton Miller played his college ball at Ohio State. Gifted with tremendous athleticism, Braxton made the jump from quarterback to wide receiver after a shoulder injury caused him to miss the entire 2014 season. With the QB job firmly in the hands of JT Barrett and Cardale Jones, Braxton posted 26 receptions for 341 yards and 3 TDs. He also rushed for an additional 261 yards and a TD on 43 carries. He’d declare for the 2015 NFL Draft. An intriguing raw talent, Braxton was selected in the 3rd round by the Houston Texans. The Texans were desperate to reload their sluggish offense with speed and talent, so after selecting Will Fuller in the first round, they decided to select Miller and groom him to work the slot catching passes from new quarterback Brock Osweiler. He’d finish his rookie season with 15 receptions for 99 yards and his first professional TD, recorded against the Raiders in Mexico City during Week 10. Braxton lost the remainder of this 2016 season to a shoulder injury. 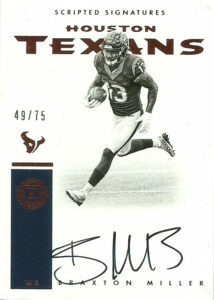 I am not really sure what the Texans’ plans truly were for Miller. It was thought he’d be brought along slowly, as Miller has pressed into duty into 2017, thanks in part to injuries, suspensions, and a lack of talent that continue to plague the wide receiver corps. Playing in 11 contests Miller had 19 receptions for 162 yards and a TD. He also displayed some speed making a career long 57 yard grab. I really love these two cards of Braxton. The art design on the Scripted Signatures card is minimal but superb. 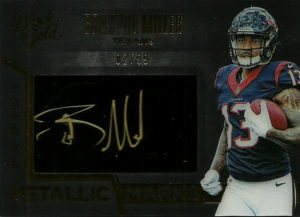 The Black Metal card is unique, even though the photo seems a bit bland, and does a great job of showcasing Miller’s autograph in gold.